﻿ Boutique Raft Resort River Kwai, Kanchanaburi | FROM $50 - SAVE ON AGODA! 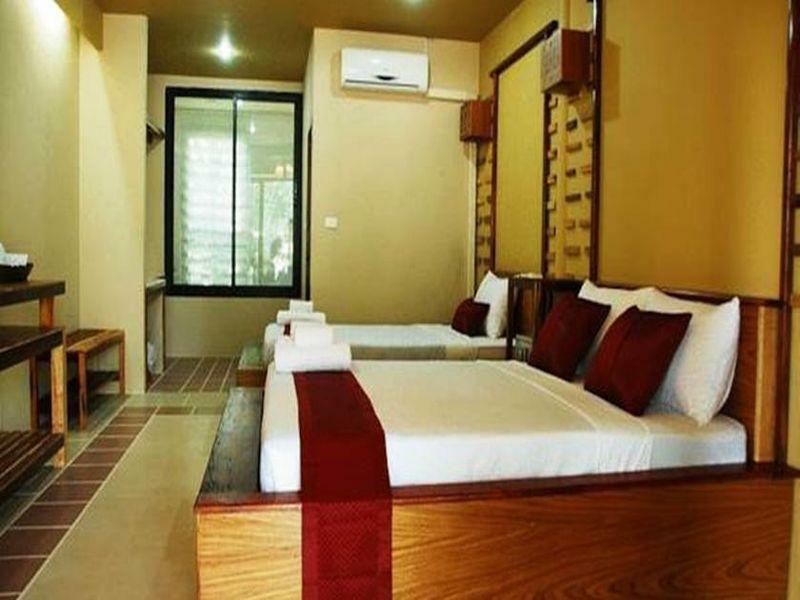 "Reasonable priced in-room massage & dining options service a..."
Have a question for Boutique Raft Resort River Kwai? "Tis is an amazing resort at Kanchanaburi." "The room is big and clean." "A big and comfortable room"
"Even a bit far from the city, this resort is very beautiful..."
As the name suggests, the unique aspect of this resort is its rooms, which are set atop a floating raft. Despite the rustic, close-to-nature setting, the Boutique Raft Resort River Kwai provides hot water for showers, a restaurant, and a bar on-site. Wi-Fi Internet is accessible in all rooms, there is even a golf course within three kilometers of the property. The resort can organize tours to the various sites in the city, such as the War Memorial, Death Railway, the hot springs, and the must-see tiger temple. 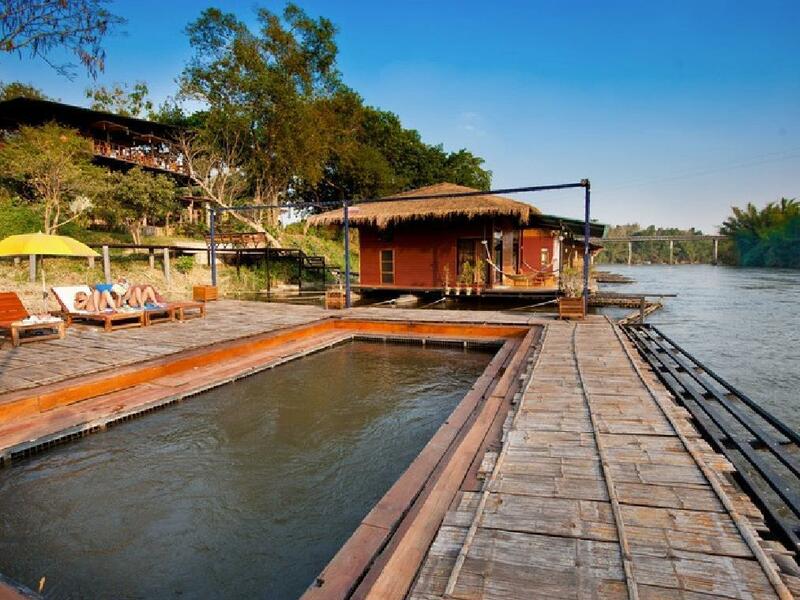 Experience Kanchanaburi at a leisurely pace with a stay at the Boutique Raft Resort River Kwai. "We were looking forward to the unusual experience of staying..."
Children 0-3 years old will receive breakfast free of charge. Children 4-9 years old will be charged THB 200 for breakfast per day. Children over 9 years old is considered as adult and will be charged THB 500 for breakfast per day. I impress this hotel so much. Good location easy to find. Many staff that helpful. Beautiful view aloong riverside for raft room. Quite and so peaceful (might because i stayed on sunday night). Worth to pay. Just hair dryer that not provided but can walk to request from front, also no telephone for room service that need to call by your phone or walk to front also. But that fine. Wifi is fast and work. We booked a Honeymoon Suite for our family of 2 adults and 3 children. The room is very spacious and has 2 double beds. Even though the 2 large beds were able to accommodate all 5 of us, the hotel policy dictates that we had to pay for 1 extra bed (includes breakfast) for 1 child and also pay for breakfast for 2 other children. Nevertheless, we had a very enjoyable stay. The Honeymoon Suite has its own private pool so we could all dip into the river anytime. Every morning, schools of fish gather in our pool and my children enjoyed feeding the fish (bought some bread from the convenient store). The hotel is located about a mile from the main road if you need to go to the shops and restaurants. It would be better to self drive here as free parking is available. First experience with raft resort. Staff are polite and helpful. Like the raft water swimming pool. Remember to bring insert repellent for Mosquitoes. It will good if you have TV in room and soundproofing walls ( can hear nextdoor talking ). No problem with wifi and air-con. We were looking forward to the unusual experience of staying on a raft & we loved every moment of it. The room was cosy with a spacious bathroom & kitchenette, flanked by a verandah that had me lazing outside every opportunity I had, enjoying the sights & sounds of the river. Loved the ambiance & picturesque of the entire resort. Quiet place, close to Nam tok train station and Sai Yok park. They have minibar in the room filled with drinks, but no safe in te room. Possibility to rent motorbikes or book tours. we stayed at the raft room, the view of the river was really nice. we needed to walk up and down steps from the reception to room and back, so it can be a little tiring at times. there was a small fridge, fan, a/c in room. no tv. hairdryer was on request. room service (many Thai dishes, some pasta and sandwiches with variety of drinks - juices, cocktails, whisky, beer, wine) was available until 9 pm. so it was convenient. overall was quite nice but unfortunately the guests next to our room was quite noisy. they kept talking (if not partying) to each other (louder than usual) until 2 a.m. I chose this boutique above the rest because of their prompt communication in English and their reknown hospitality. Even the local driver that took us to Erawan praised their standards of hospitality compared to neighbouring Raft resorts. They helped me find routes and best (and cheapest) options to get around, and were attentive to the needs of my friends and I. I got to stay on Raft room 1 & 4.... they had to move us due to some piping issue so it was nice to compare. It was obvious room 1 was more sound proofed from the river noise at night but overall it was a comfortable and clean stay by the river. Breakfast and dinner was good quality and variety although taste could not beat some of the street vendors we tried. Amenities were great for relaxation. Love the all wood natural feel and attention to details. I highly recommend this place. Wooden raft house by the river. We had a lot of fun soaking our feet in the river just at the back of our room. It was fun feeding the many fishes too. The hotel is clean and had all we need but it’s a little too out of the way without a car. This resort is very good, if you need time to relax without TV in room, you will find peaceful in here with fresh air. and this place is not far from Sai Yok Waterfall which have many shops to find something to eat and shopping. Nice resort concept with raft chalets. On site restaurant serves good food. Service is also very good. 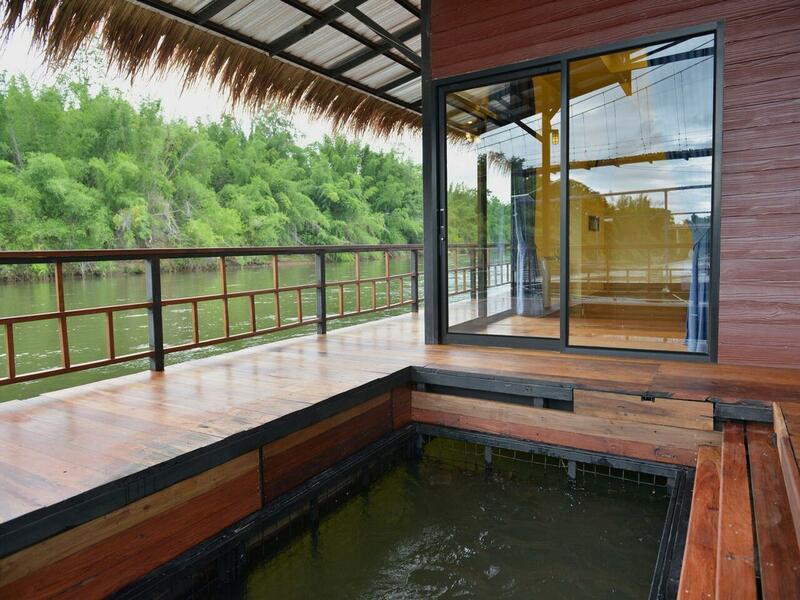 Raft chalets are all made of wood and bamboo, some parts need some maintenance. Price I paid for the raft chalet is a little steep though. Attentive staff, breathtaking views, quite and peaceful. This place is, by far, my favorite hotel during my time in Thailand. My first time to stay on raft at River Kwai , I met this resort in Agoda , the photo look nice and attract me to booking. When I arrive my booking room full , so resort upgrade me to bigger raft. + Resort staff very polite and ready to support guest. + Nice building decoration. + The raft are spectaculars , great view , my room have a small pool like a natural Jacuzzi. + Bathroom so big and have bathtub. + Cleanliness , housekeeper are good. + Main pool are nice and safe , do not swim in the river - tide are rapidly , if you need resort prepare life vest for you. + Taste of food are good , do not go out for dinner. + Incredible experience for my first time on raft. + Manythings here are great , over my expectation. - Cable TV do not operate but can fix by resort technical. - Breakfast not much type of food but the taste good. - More insects in this area , should prepare insect repellent by yourself. - If other resort have a party , the noise can annoy you but may be not over 10:00pm.